Happy Stamping Sunday! Today's theme is, "Feeling Fruity" and I was certainly feeling that when I created this nailart! This is my play on Golden/Red Delicious apples. Even though I don't really like either of those. I really like crisp apples, like Honeycrisp or Tango apples. I guess I usually tend to associate fruity nailart with Spring and Summer colors - vivid brights and neons, so I was thinking of a way to give this a more winter seasonal look, and I think the champagne gold background does that. 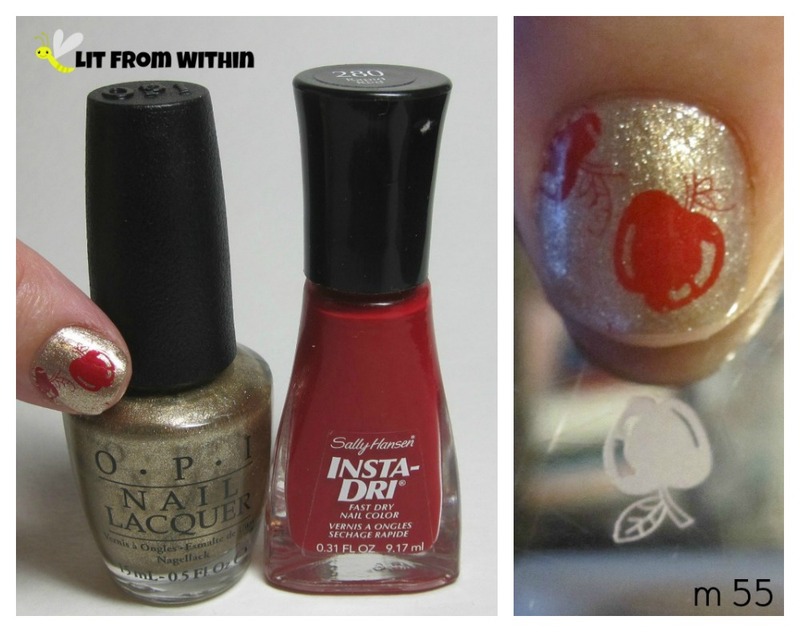 What I used: OPI Glitzerland, Sally Hansen Insta-Dri Rapid Red, and my m55 stamping plate. Are you feeling fruity today? Thank you for your comments! They mean so much to me, and I read all of them, even if I don't always have a chance to respond.